The last time you went to a zoo, amusement park, museum, or climbed aboard a bus or ferry, do you remember buying your ticket or being admitted? If you don’t, that’s a good thing. Why? Because chances are you had a smooth and easy experience. That’s what Gateway Ticketing Systems does. We create high-speed admission control systems and ticketing software for the attraction, amusement and transportation industries, and our aim is to help get you through the front gate and on your way to having fun as quickly and easily as possible. No lines, no waiting, no frustrations at the ticket window. We’ve been in business for 19 years now, and in that time have grown to be the world leader in what we do. Our customers include major amusement parks and other attractions in locations all over the US, and other places around the globe, including the UK, Europe, Asia and the Middle East. We at Gateway have had the pleasure of calling Boyertown home for all of those 19 years, and enjoy being a part of the Boyertown community. 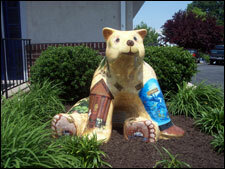 We proudly support organizations like United Way of Boyertown, American Heart Association and its Berks County Heart Walk, and the Humane Society of Berks County, and we’re thrilled to be taking part in the Bear Fever project. 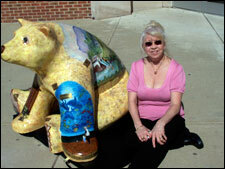 Pattie Milam, the artist for the Gateway bear, had the design inspiration for the bear by doing some research on the industry and then depicting scenes on the bear that capture the essence of what the industry does. Pattie chose images that would add personality and draw the audience in. 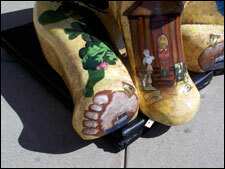 Once Pattie decided on an image, she researched the details and then went about the task of creating the artwork on the bear. 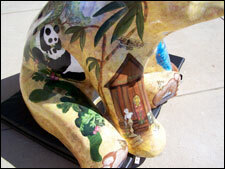 For example, on the bear’s back, she painted a pair of pandas at play, and the right front leg depicts a scene inspired by a museum. 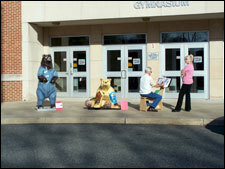 Our company-wide naming contest winner bestowed the name “Tix” on the Gateway Bear. Tix is quite happy with the artistry she now wears on her hide. “Sure beats plain old brown. And when I get bored, I don’t have far to go for some entertainment,” Tix said. That’s true, and she doesn’t even have to buy a ticket. Patricia A. (Townsend) Milam was raised in a one-room school house in Pennsburg, PA, which her parents rebuilt for a family of seven. She has always had a love for art but never knew how to actualize her talent. She graduated from Perkiomen High School in East Greenville, PA, and received state, local, and chapter degrees and certificates in homemaking. Self-taught in a variety of art forms, Patti enjoyed an association with Shirley Thomas, an artist featured in Arts Works magazine which allowed her to assist and participate in classes for up-coming artists. Patti has showcased her artistry in creating flower arrangements for weddings; painting murals for children’s bedroom walls featuring nursery characters, action figures or scenes; and fashioning wedding and birthday cakes. 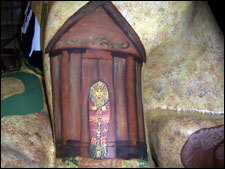 She has served as interior decorator and a wax sculptor for a variety of organizations. Patti’s rewards have been founds in the laughter and smiles of all the children she has entertained as Sparkles the Clown at Cool-lea campground in Watkins Glen, New York. She has also enjoyed teaching children how to paint and play well with others while they have learned various art projects in a friendly and educational environment. Making Mop Dolls with sick children has been rewarding as well. Patti credits her mother and father for being role models for her. Their hard work and accomplishments have guided her in her own pursuits toward her dreams. She is grateful to her husband as her #1 supporter. He encourages her to move forward as far as she can. Patti is also eager to thank all the folks who have shown faith in her abilities in creating “Tix” for Gateway Ticketing.